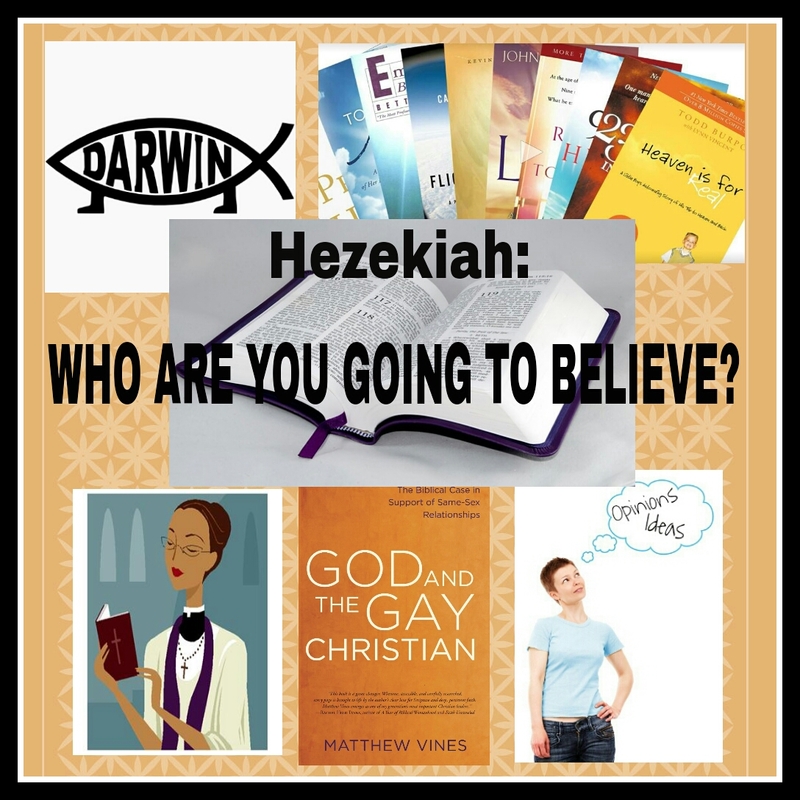 Hezekiah: Who Are You Going to Believe? This first part of the chapter sets the stage for everything we subsequently learn about and from Hezekiah. Even though he had a despicable, idolatrous example for a father (King Ahaz), Hezekiah somehow turned out to be a godly man and king. Could it have been the way his mother raised and taught him? Possibly. (The Zechariah mentioned in v. 2, is not the prophet in the book of the same name.) It could also have been one of the priests or Levites brought in to train him as part of his childhood education. Scripture doesn’t tell us specifically, but we should never discount the importance of a godly mother or teachers, and we should strive to take hold of every opportunity we have to impact children’s lives for Christ. His actions followed his faith: he tore down idol worship paraphernalia, rebelled against the king of Assyria, and struck down the Philistines. This passage continues to set the stage by reminding us that during the first few years of Hezekiah’s reign in Judah, the king of Assyria captured Samaria (capital of Israel) and carried Israel away to Assyria because they had rebelled against God. Sennacherib (king of Assyria after Shalmaneser, who had captured Israel) wasn’t wild about Hezkiah rebelling against him, so he attacked Judah and captured all the stronghold cities except Jerusalem (the capital), which was next on the hit list. When we face an impossible situation like Hezekiah did, we have two options: we can let our circumstances dictate our response, or we can let God’s word dictate our response. Hezekiah didn’t consult God’s word. So, since he didn’t know what God would have him do in this situation, his only remaining option was to let circumstances dictate his response. What happened? The 11 tons of silver and 1 ton of gold that Hezekiah sent Sennacherib, king of Assyria weren’t good enough for him. So Senaccherib sent his goon squad over to make Judah an offer it couldn’t refuse. Egypt was weak and would be of no help in fighting off Assyria (21,24). In fact, Isaiah had already told them this (Is. 30). From man’s point of view, and in his own flesh, Hezekiah would lose this battle and the people would be carried off to captivity in Assyria (29-32). The false gods of the other nations had not been able to save them from Assyria (33-35). God might have been against Judah, but he wasn’t with Assyria (25). The Lord is trustworthy and able to defeat any enemy (30, 32b, 35). Hezekiah’s officials delivered the message to him. Would he believe the Rabshakeh? Would he react the way he did last time? Hooray for Hezekiah! This time, he responded the right way. The first thing he did was to grieve before God and head to His house to pray (1). The second thing he did was to send his staff to Isaiah to seek God’s word. (2-4). Hezekiah had a choice to make. Who was he going to believe, the Rabshakeh or God? The Rabshakeh had said a lot of stuff that was true. He even said that God had sent him. It would have made sense to listen to him, do what he said, and surrender. But that’s not what Hezekiah did. He again turned to the Lord in prayer. While he was praying, Isaiah heard from the Lord, who reiterated and expanded on his earlier promise: God would defeat Assyria in this battle, and would even give Hezekiah a sign that confirmed His word. 35-37 Even though it seemed reasonable to believe Sennacherib, and even though he had talked about God sending him, Hezekiah chose to believe God’s word. He believed God’s word even though the situation seemed impossible. Even though he was scared. Even though it didn’t make sense. “Pastors” and “theologians” who tell us that evolution or homosexuality or abortion or female pastors/teachers (of men) are OK with God, or that the Bible isn’t infallible. Christians who tell us about trips to Heaven they have taken or “God told me ______” even when it conflicts with Scripture. Are we going to believe fallible, sinful human beings, or are we going to believe God’s word, even when it’s hard, even when we don’t fully understand it? For Christians, SCRIPTURE ALONE is our final authority for what to believe, think, and do. It doesn’t matter what we (or someone else) have personally experienced, what our feelings or opinions are, what science says, what conventional wisdom says, or what political correctness says. God’s word stands, and let the chips fall where they may.